Amped Software was one of the main sponsors of this year’s Ontario Forensic Video Analysts Association Training Conference (www.OFVAA.com) held in Niagara Falls, Canada, where 30 analysts from Canada, the US, and the UK attended. Given the outstanding relationship Amped Software has with the OFVAA, we decided to do something exceptional this year and provided an Amped license for a draw during the event. Michael (Mick) Green, from North Wales Police in the UK, was the lucky winner. Mick paid for the travel and training himself, to gain insight into the techniques used to establish suspect height ranges as this is an important part of his daily work. 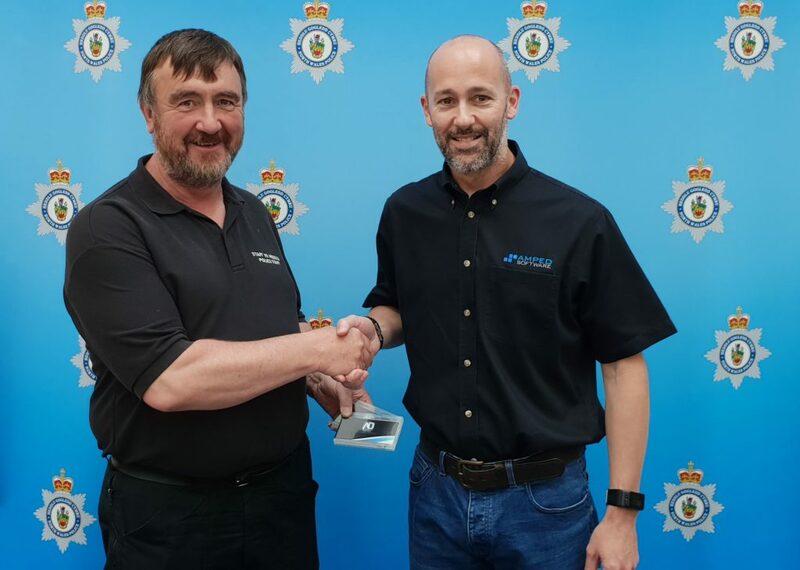 A few days ago, our international trainer, David Spreadborough, attended North Wales Police to deliver the software and give Mick a few tips on its use. We hope you enjoy using Amped Mick! And we look forward to seeing you soon on a training course to get hands-on training on the use of our products as well as get some insights into the challenges users face in forensic video and digital multimedia evidence processing. Now it’s time to go get your evidence Amped! This entry was posted in Announcements on June 8, 2018 by Darlene Alvar.